Windows 10 will power an incredibly broad range of devices – everything from PCs, tablets, phones, Xbox One, Microsoft HoloLens and Surface Hub. It will also power the world around us, core to devices making up the Internet of Things, everything from elevators to ATMs to heart rate monitors to wearables. Long Term Servicing Branch as a deployment option for their mission critical devices and environments. And as with prior versions of Windows, Active Software Assurance customers in Volume Licensing can upgrade to Windows 10 Enterprise as part of their existing Software Assurance benefits. 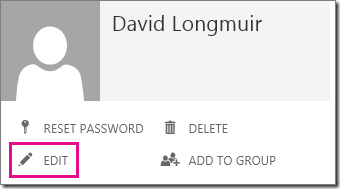 Understanding Office 365 identity and Azure Active Directory!!! 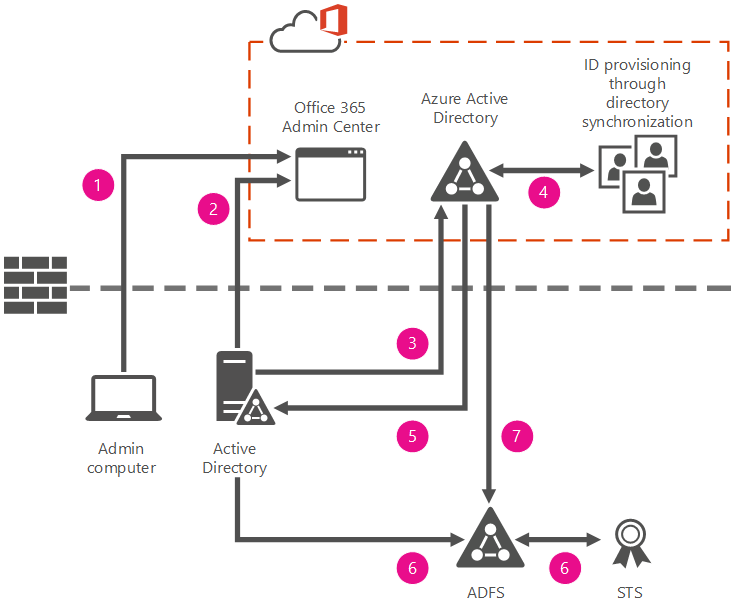 Understanding Office 365 identity and Azure Active Directory. Cloud identity: Manage your user accounts in Office 365 only. No on-premises servers are required to manage users; it’s all done in the cloud. In this model, you create and manage users in the Office 365 admin center and store the accounts in Azure AD. Azure AD verifies the passwords. Azure AD is the cloud directory that is used by Office 365. No on-premises servers are required — Microsoft manages all that for you. When identity and authentication are handled completely in the cloud, you can manage user accounts and user licenses through the Office 365 admin center. The following figure summarizes how to manage users in the cloud identity model. 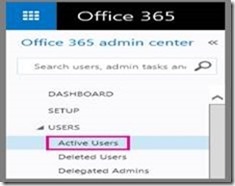 In step 1, the admin connects to the Office 365 admin center in the Microsoft cloud platform to create or manage users. In step 2, the create or manage requests are passed on to Azure AD. In step 3, if this is a change request, the change is made and copied back to the Office 365 admin center. 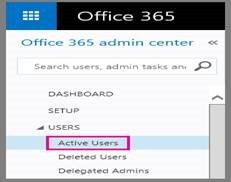 In step 4, new user accounts and changes to existing user accounts are copied back to the Office 365 admin center. In this model, you manage the user identity in an on-premises server and synchronize the accounts and, optionally, passwords to the cloud. 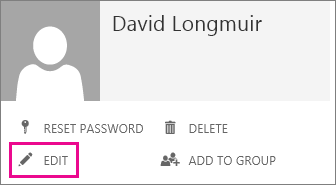 The user enters the same password on-premises as he or she does in the cloud, and at sign-in, the password is verified by Azure AD. 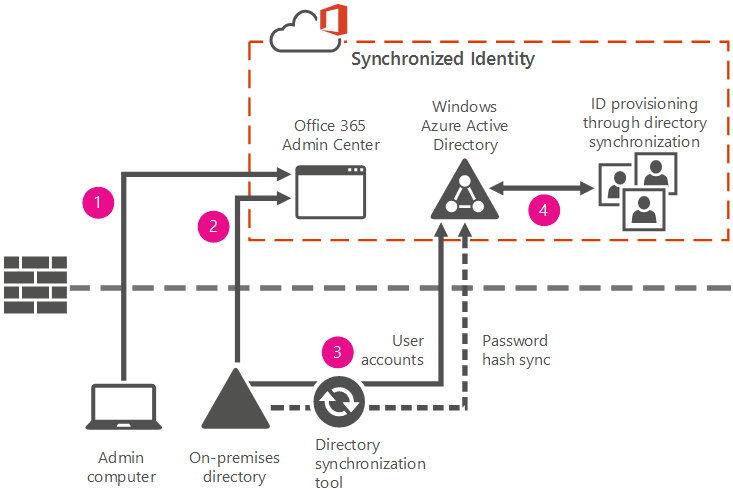 This model uses a directory synchronization tool to synchronize the on-premises identity to Office 365. To configure the synchronized identity model, you have to have an on-premises directory to synchronize from, and you need to install a directory synchronization tool. You’ll run a few consistency checks on your on-premises directory before you sync the accounts. When you have an on-premises directory and you want to synchronize user accounts and optionally passwords. If you also synchronize passwords, your users will use the same password to access on-premises resources and Office 365. When you ultimately want federated identities, but you are running a pilot of Office 365 or, for some other reason, you aren’t ready to dedicate time to deploying the Active Directory Federation Services (AD FS) servers yet. The following diagram shows a synchronized identity scenario with a password synchronization. The synchronization tool keeps your on-premises and in-the-cloud corporate user identities synchronized. In step 1: you install a Microsoft Azure Active Directory Connect. For instructions, see Set up directory synchronization in Office 365. For more information about Azure Active Directory Connect, see Integrating your on-premises identities with Azure Active Directory. In steps 2 and 3: you create new users in your on-premises directory. The synchronization tool will periodically check your on-premises directory for any new identities you have created. Then it provisions these identities into Azure AD, links the on-premises and cloud identities to one another, synchronizes passwords, and makes them visible to you through the Office 365 admin center. In step 4: as you make changes to the users in the on-premises directory, those changes are synchronized to Azure AD and made available to you through the Office 365 admin center. This model requires a synchronized identity but with one change to that model: the user password is verified by the on-premises identity provider. This means that the password hash does not need to be synchronized to Azure AD. This model uses Active Directory Federation Services (AD FS) or a third-party identity provider. If you already have AD FS deployed for some other reason, you will likely want to use it for Office 365 also. If you already use some other identity provider, you will want to use federated identity with Office 365. Microsoft provides a list of identity providers that work with Office 365. If you use Forefront Identity Manager, you will also want to use federated identity with Office 365. You have multiple forests in your on-premises Active Directory Domain Services (AD DS). You have an on-premises integrated smart-card solution. You have an existing custom hybrid application, for example with SharePoint or Microsoft Exchange Server. You require sign-in audit and/or immediate disable. You have sign-on restrictions by network location or work hours. You have other policies in place that require federated identity. The following diagram shows a scenario of federated identity with a hybrid on-premises and cloud deployment. The on-premises directory in this example is AD FS. The synchronization tool keeps your on-premises and in-the-cloud corporate user identities synchronized. In step 1: you install Azure Active Directory Connect. The synchronization tool helps to keep Azure AD up-to-date with the latest changes you make in your on-premises directory. Set up directory synchronization in Office 365. Specifically, you will need to use a custom install of Azure AD Connect to set up single sign-on. In steps 2 and 3: you create new users in your on-premises Active Directory. The synchronization tool will periodically check your on-premises Active Directory server for any new identities you have created. Then it provisions these identities into Azure AD, links the on-premises and cloud identities to one another, and makes them visible to you through the Office 365 admin center. In steps 4 and 5: as changes are made to the identity in the on-premises Active Directory, those changes are synchronized to the Azure AD and made available to you through the Office 365 admin center. In steps 6 and 7: your federated users sign in with your AD FS. AD FS generates a security token and that token is passed to Azure AD. The token is verified and validated and the users are then authorized for Office 365. Pin & Unpin files in Office Mobile for Windows 10 !!! If you have files that you use often, you can pin them to the Windows Start menu or the Pinned list in Word, Excel, or PowerPoint so you can get to them quickly. From any file, tap File > Open. In the list of files, tap the down arrow next to the file you’d like to pin. 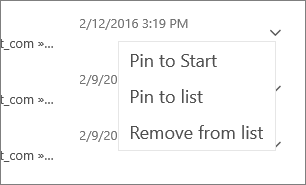 Pin to Start—pins the file to the Windows Start pane. Pin to list—pins the file to the top of the file list in the app. NOTE If you open an app, and haven’t opened a file yet, you can still pin files. From the New screen that appears when you first open an app, tap the down arrow next to the file you’d like to pin and choose Pin to Start or Pin to list. To remove a file from your pinned list, tap the down arrow next to the file and select Remove from list. The file will still be available, but it will move down into the list of files that aren’t pinned. To remove a file from the Windows Start screen, press and hold the tile (on a non-touch device, right-click) and choose Unpin from Start. 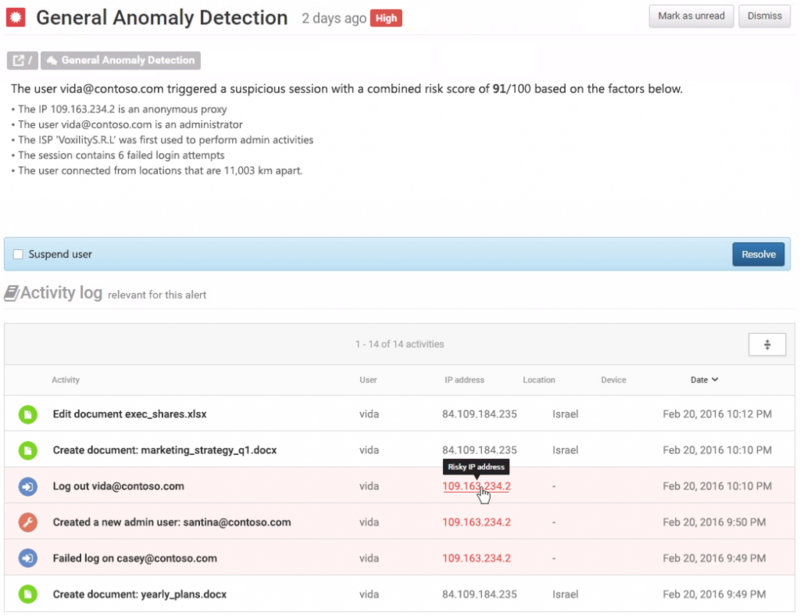 New security management and transparency capabilities coming to Office 365!!! 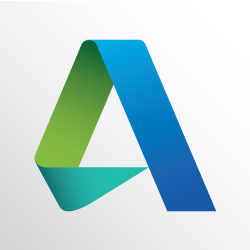 Microsoft Cloud App Security, a comprehensive cloud access security broker (CASB) solution, based on Microsoft’s acquisition of cloud security innovator Adallom . It will also power new advanced security management capabilities for Office 365 that will improve IT visibility and control. 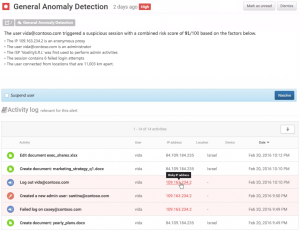 Office 365 advanced security alerts alert you to anomalous and suspicious activity so that you can take action. The system notifies you of unusual behavior, such as if a user takes an administrative action (like creating a new user) from a location they have never logged onto before. Office 365 app permissions gives you the ability to approve or revoke permissions for applications accessing Office 365. For example, you may have users who have approved their CRM application to access Office 365 contact data. If that CRM application is a non-sanctioned app that doesn’t comply with your business policy, you may want to revoke access. These new capabilities will begin to roll out in the third quarter of this year and will be offered as part of the Office 365 E5 plan. Step-by-Step Guide to Migrate from Exchange Server 2007 to Exchange Server 2013!! Before planning your Exchange Server 2013 migration ensure you are familiar with all its features like virtualization, retention, modern public folders, managed availability, transport, unified messaging, EWS, Outlook Web App etc. As Exchange is critical to the communication network, it is important to do a smooth Exchange migration which causes minimum or zero interruption to the organizational communication. In this blog, we will see how to migrate all users and services from Exchange 2007 to Exchange 2013 and finally decommission the old Exchange 2007. When we install Exchange Server it needs to store User mailboxes’ and Exchange Server’s configuration information in the organization. So it is important that Active Directory is duly prepared before you install Exchange 2013 in the organization. Following things need to be done before you deploy Exchange Server 2013 in the environment: a> Extend Active Directory Schema b> Prepare Active Directory and 3> Prepare Active Directory Domains. To ensure that AD preparation is done correctly, verify that the rangeUpper property on ms-Exch-Schema-Version-Pt is set to the correct value. After this force AD replication. After the installation is complete restart your server. And after the reboot, download and install Microsoft Unified Communications Managed API 4.0. Core Runtime 64-bit, Microsoft Office 2010 Filter Packs 64 bit, Microsoft Office 2010 Filter Packs SP1 64 bit. You should be using as few certificates and host names as possible for cost control since certificate providers charge a fee based on number of host names you add to your certificate. By default, Exchange comes with self-signed certificates, we will replace this certificates with the ones relevant to our case. contoso.com: FQDN for most connections to Exchange including Microsoft Outlook, Outlook Web App, Outlook Anywhere, the Offline Address Book, Exchange Web Services, POP3, IMAP4, SMTP, Exchange Control Panel, and ActiveSync. contoso.com: FQDN used by clients that support Auto discover, including Microsoft Office Outlook 2007 and later versions, Exchange ActiveSync and Exchange Web Services clients. contoso.com: FQDN used by all external and internal clients for old server i.e. Exchange Server 2007. Once the certificate is created, get it signed by the appropriate certification authority (CA) and use the Import-ExchangeCertificate to import the certificate. 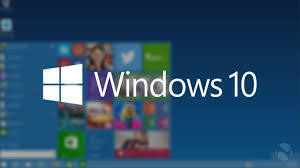 Then Exchange Server 2013 need to be configured to use the certificates using the Enable-ExchangeCertificate command. Please note that Enable-ExchangeCertificate cmdlet cannot be used to enable a wildcard certificate for POP and IMAP services, also it cannot be used to enable a certificate for federation. Use private key to export the certificate and import it on Exchange 2007 CAS servers using the same steps. Transport rules cannot be migrated from Exchange Server 2007 to 2013. So you need to do the following to get Transport rules in Exchange Server 2013. In the Exchange 2007 management shell you need to run the following commands. Next update your publish rules for Exchange 2007 to accept connections for Legacy name space. And then publish Exchange Server 2013 using TMG. In the Internal DNS, point mail.contoso.com and autodiscover.contoso.com to Exchange 2013 server. And in Legacy.contoso.com new record points to Exchange 2007 Server. In the Public DNS, point mail.contoso.com and autodiscover.contoso.com to TMG listener and for Legacy.contoso.com point new record to TMG Listener. Next you can use New-MoveRequest cmdlet to start mailbox or personal archive migration. To check mailbox readiness before starting to move mailboxes you can use WhatIf parameter. You can also create batch move if you want. In the Exchange 2013, create PF mailboxes using New-Mailbox –PublicFolder cmdlet. Migrate PF content using New-PublicFolderMigrationRequest cmdlet. Test new public folders to ensure everything is alright. Then us the following cmdlet to unlock the PF migration. Thus we complete the entire Exchange Server 2007 to 2013 migration process. If a user no longer needs licenses, like when an employee leaves an organization, you can delete that user’s account. When you do this, any licenses that were assigned to that person become available to assign to another user. Tip You need to sign in as either a Global admin or a Billing admin. 2. Select the app launcher icon in the upper-left and choose Admin. For all other business and enterprise subscriptions, select Users > Active Users. · For Office 365 Small Business Premium, click . · For all other business and enterprise subscriptions, click DELETE. In the confirmation box, click Yes. As a global or user management admin, you can easily assign licenses to new users when creating new accounts, or to users with existing accounts. To free up license that can be assigned to other users, you can also unassigned licenses that users no longer need when people leave the organization. · If you see Welcome, let’s get started in the middle of the page, click Hide the Getting Started pane to close it. if you have 25 licenses and have assigned 1 of them, it will say 24 licenses available out of 25. Check the Valid, Expired, and Assigned columns for your subscription. To figure out how many valid licenses are still available to assign to users, subtract the number of Assigned licenses from the number of Valid licenses. If a user’s job responsibilities change, a global admin or user management admin can unassign the licenses that the user no longer needs. In addition, if you have more users assigned to a service than you have available licenses, you can remove licenses from users who no longer use them. Under users & groups, click Add users, reset passwords, and more. · Check the box for the name of the user who you want to add or remove a license for and then click . · To assign a license to the selected user, select the box for the license you want to assign. To unassigned a license from the user, unselect the box for the license you want to remove. · If you have removed a license from a user and want to assign it to another user, repeat this procedure. · Check the box for the name of the user who you want to add or remove a license for. 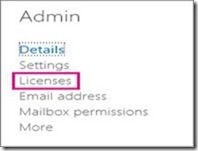 Tip When assigning a license to a user, you can also select which services are enabled by that license the user can use by selecting the down-arrow next to the name of the license and unselecting the services that you want to restrict from that user. For example, if you want the user to have access to all available services except Lync Online, you can unselect the Lync Online service.